Ideal for close-range, fast-moving targets, the Sightmark Ultra Shot QD Digital Switch Reflex Sight is equipped with a digital switch button on the side to adjust variable brightness settings in any lighting condition. Shooters can take advantage of its quick-detach mount for easy removal when Iron sights or other accessories are used. 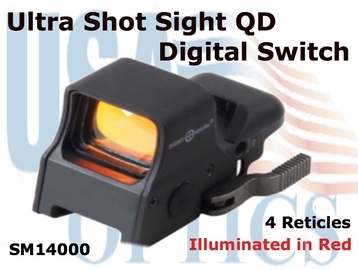 Built for exceptional durability, the Ultra Shot QD Digital Switch includes a protective, aluminum shield hood for added defense, making it even more durable than the original Ultra Shot model. Its matte black finish eliminates reflection and delivers a sleek, tactical look. An alternative to overly expensive MIL-SPEC models, the Ultra Shot QD Digital Switch Reflex Sight comes with the quality expected from the Sightmark brand and is protected by the Limited Lifetime Warranty. Brightness Settings	1 to 5 and "Off"